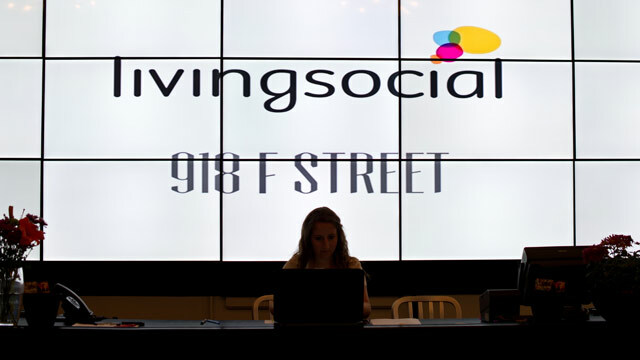 View of the reception desk at Living Social in Washington on June 26, 2012. Online deals site LivingSocial said its computer systems were hacked on Friday, which may have compromised the personal data of more than 50 million of its customers. Hackers gained access to customer data from the company's servers, which included their names, email addresses, dates of birth, and encrypted passwords, the company said. The cyber attackers did not gain access to the database where customers' credit card information was stored, LivingSocial spokesman Andrew Weinstein told ABC News. Weinstein said customers in South Korea, Thailand, Indonesia, and the Philippines were not impacted by the security breach since their passwords were stored on different servers. But in all other countries where LivingSocial operates, customers were being notified that their information was at risk in the breach. On LivingSocial's website, the company provided a banner notice for customers to update their accounts. Weinstein said that since the hack, customers were also notified in an email written by CEO Tim O'Shaughnessy to change their passwords. O'Shaughnessy also advised customers to reset their passwords on other websites if they were similar to the ones they used on LivingSocial. "The security of your information is our priority. We always strive to ensure the security of our customer information, and we are redoubling efforts to prevent any issues in the future," O'Shaughnessy wrote. O'Shaughnessy also emailed his staff -- who he referred to as LivingSocialities -- to notify them of the hack. "We need to do the right thing for our customers who place their trust in us," he wrote, "We'll all need to work incredibly hard over the coming days and weeks to validate that faith and trust." The hack is one in a recent string of online security breaches, including Facebook and Evernote. On Tuesday, the Associated Press' Twitter account was hacked, causing the stock market averages to briefly plunge and false reports of explosions at the White House to circulate. LivingSocial said it was actively working with law enforcement to investigate the cyber attack. The company did not explain how the hack occurred.